1. The list of 'wilayas' ('provinces') of the Islamic State in the above screenshot is particularly interesting. In total, IS counts 35 wilayas: 19 inside Iraq and Syria and 16 outside of Iraq and Syria. 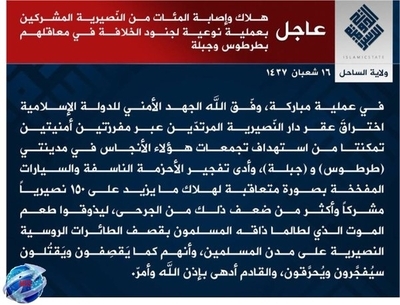 Most notably, despite widespread speculation of IS gearing up towards announcing a new wilaya in the Philippines and claims that IS is now operating as a wilaya in the Philippines, there is no mention of the Philippines as a wilaya. Nor is there any mention of Tunisia, Indonesia, Somalia and Bangladesh: countries where IS has also claimed operations. The last real expansion on the geographic stage on the international level was the Caucasus wilaya a year ago. In my view, the lack of new wilaya announcements reflects an IS strategy of avoiding wilaya announcements because they lack credibility without realisation of governance and administration on the ground akin to the system in place in IS-controlled territories in Iraq and Syria. With the exception of Libya (though this too is now in doubt with the attacks on the IS stronghold of Sirte), the wilaya projects abroad have been disastrous in so far as achieving administration on the ground (Arabic: tamkeen). Internal dissent in IS (which I will discuss in a later post using some unseen internal documents) long recognized this problem, and advised against wilaya announcements and that allegiance pledges should be taken secretly. While the latter point has not been heeded, IS now seems more cautious in translating allegiance pledges into the creation of new provinces. In terms of other wilayas, it should be noted that Wilayat al-Bahrain (for eastern Saudi Arabia) and Wilayat al-Sahel (for the coastal areas of Tartous and Latakia in Syria) are absent, despite references to such entities in IS propaganda elsewhere. 2. The diwans, committees and offices listed in the video generally correspond to the documentary evidence I have uncovered but naming is not always consistent. For example, the office for public relations and tribes sometimes comes under the diwans designation in the documents. Likewise, the investigations and studies office has also appeared as a diwan ('Diwan al-'Eftaa wa al-Buhuth). In addition, no mention is made of the Diwan al-Wilaya or the Idarat Aama ('General Administration') on the more local level. Certain functions do not always come under the same diwans, and sometimes names for separate diwans come up, raising issues of how centralized administration truly is and how much autonomy wilayas have. For example, I have previously seen documents that talk of the Diwan al-'Aqarat ('Real Estate Diwan'). 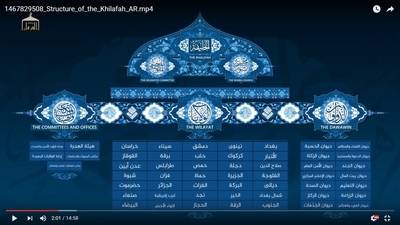 There is also no mention of the General Supervisory Committee (Al-Lujna al-Aama al-Mushrifa) that has issued wider notifications to the wilayas, diwans and committees, though it appears to be the same as the Delegated Committee (Al-Lujna Al-Mufawwadha) mentioned in the video, to which more serious matters can be referred by the wali in addition to responsibilities for supervising other committees. 3. Functions of Diwans can overlap in ways not mentioned in the video. For example, the Diwan al-Hisba is well known for enforcing Islamic morality, but it can also deal with issuing temporary exit permits for residents of IS territories and Internet security regulations. Some functions are not mentioned, like the Diwan al-Rikaz's management of activities, or that the Hijra Committee manages border crossings for temporary visitors to IS territory in places like Dabiq. 4. The media section makes no reference to Amaq News, which arguably fits in with the modus operandi of an IS 'auxiliary outlet' whereby links to IS are not officially admitted, even as most observers now recognize the outlet's real function. 5. Note the mention of the Distant Provinces Administration, whose name first emerged in leaked documents during the controversy ofdissent in the Yemeni affiliates.